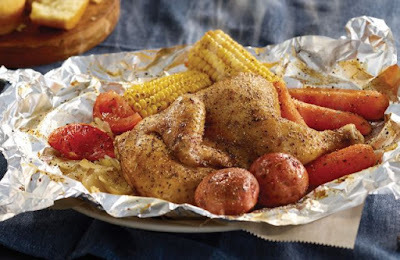 Campfire Meals are back at Cracker Barrel Old Country Stores. The meals come to the table wrapped in foil as if they just came off the campfire. There are two Campfire Meals currently being served: Campfire Chicken and Campfire Beef. A third meal, Campfire Mixed Grill is set to arrive starting June 27, 2016. Campfire Mixed Grill features the same vegetables paired with beef chuck roast and smoked sausage, plus the choice of biscuits or muffins. It'll arrive June 27, 2016 for $10.99 and will be available through August 14, 2016.